This Unit has one large open plan living/dining area, a separate bedroom and a separate bathroom. There is a set of single bunks in the main living room and a queen bed in the bedroom. All beds are made up with full linen. The bedroom also has bedside tables, reading lamps, a mirror, wardrobe and a set of drawers for your belongings. 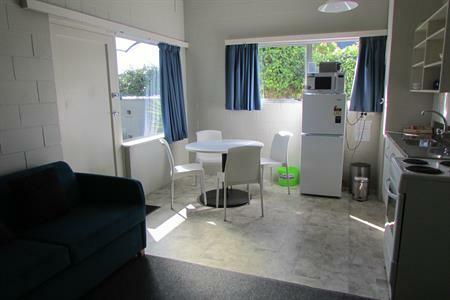 There is a full kitchen at one end of the open plan living room, fully-equipped with a stove, microwave, and fridge/freezer. There is also a toaster and electric jug, pots, electric frying pan, crockery and cutlery. Tea towels and dish washing liquid are provided. Your living/dining area has an LCD colour television with Freeview, a dining table and chairs, and a double sofa bed. Our self-contained units are not serviced during your stay, however you can use our park laundry to wash towels and sheets during your stay as you require. Please note that Unit 1 is located near the road front so does experience traffic noise, mostly during the daytime, evenings are usually quiet.